With an architectural survey (el estudio arquitectónico) a licensed Spanish architect evaluates the structural condition of a property. This survey is usually carried out on more expensive or older houses. An architect can also perform an architectural survey on the boundaries of the land/terrain, which is especially advisable for rural properties. The Capital Gain Tax (el Impuesto sobre Incremento de Patrimonio de la Venta de un Bien Inmueble) is paid by the seller/vendor over the increased value of property according to the purchase price in the title deeds. The percentage of this national tax is 19% (for EU residents) of the profit and there are special rules for non-tax residents sellers. The Spanish law in this case requires that 3% of the purchase price is to be deducted when paying the purchase price during the completion at the notary´s office. The buyer is obliged to pay this percentage in seller/vendors´name to the Spanish tax office as a temporary deposit until the final calculation of the Capital Gain Tax (CGT) takes place. The Catastro is one of the two Spanish authorities that register a property and is part of the Spanish tax office (Hacienda). The registration of a property with the Catastro (Cadastre) is obligatory, as it provides the fiscal value (cadastral value) for the IBI tax. As well as this the Catastro deals with the registration of the boundaries of the land using photos and maps. Conveyancing or property law is the transfer process of the legal title of a property from one person to another, or the granting of an encumbrance such as a mortgage or a lien. Usually in a purchase transaction a 10% down payment (el depósito) is paid when signing the private purchase contract. This money gives the seller/vendor the guarantee that the potential buyer is really serious and will pay the rest of the purchase price at completion once the official investigation is finished. With a first occupation license or first occupancy license (Licencia de Primera Ocupación) the local town hall grants the permission to live or dwell in a property after the completion of the construction. A gestor (or gestoría) is a Spanish administrator that takes care of bookkeeping, insurance, tax issues, etc. A gestor is obliged to be a member of an official organization for gestorias in Spain. A golden visa is a Spanish resident permit granted to non-European residents. This visa can be obtained when for example buying a Spanish property of more than 500.000 Euros and the different rights are provided in various phases. The IBI (Impuesto sobre Bienes Inmuebles) is the yearly local property tax. The Spanish Catastro (part of Hacienda) provides the fiscal value (cadastral value) of the property on which the IBI is based. IVA (Impuesto sobre el Valor Añadido) is the Spanish VAT. When buying a newly constructed property in Spain the buyer doesn´t pay transfer tax, but 10% IVA. L.O.U.A. is short for ´Ley de Ordanación Urbanistico de Andalucía´. This general urban law specifies all the regulations on urban law in Andalucia. The nota simple is a summary provided by the Registro de la Propiedad (land registry) that gives information about the ownership, debts, non-paid taxes, mortgages, encumbrances, etc. of a Spanish property. The notary (la notaría) is an official of the Spanish state that verifies if the title deeds, testaments or other public documents are signed correctly and he also checks the identity of the persons involved. In the Spanish purchase process his job is very different from notaries in other European countries which mostly are responsible for the official investigation of the property, outstanding debts, official registrations and the legal content of the agreement. In Spain this work is done by a solicitor/lawyer. P.G.O.U. is short for ´Plan General de Ordenación Urbana´. This local law defines all implications of regional urban planning for a Spanish municipality, such as the classification of the towns´ different areas (urban, reserved for urbanization or rustic). The Plusvalíais the local tax over the increased value of the terrain which is paid by the seller/vendor. The percentage of the Plusvalía is based on the purchase price and other variable factors. If desired C&D Solicitors can assess this when you want to sell your property. The power of attorney or P.O.A. (el poder) is an official document that gives someone else (for example a lawyer/solicitor) the right to legally act in your name, for example when you live abroad. When signing the title deeds of a property at the notary the endorsee (el poderado) needs to have a public power of attorney. A private purchase contract (el contrato privado de compra venta) is a contract set up by a lawyer/solicitor that is signed between a buyer and seller/vendor of a property. It contains all the conditions of the purchase/sale, such the purchase price, payment plan, tax issues, the deadline for signing the title deeds at the notary and contingencies in case the buyer or seller doesn´t want to continue the sale. The Registro de la Propiedad is one of the two Spanish authorities for the registration of a property. This land registry office registers the official ownership of a property according to the information of the notary´s title deeds. The summary of the Registro de la Propiedad is called the ´Nota Simple´. Registration with this authority is highly recommendable but not compulsory. To obtain a mortgage, though, an inscription in the Registro de la Propiedad is always needed. The reservation contract (el contrato de reserva) is a short contract made by the real estate agency which is signed between the potential buyer and the seller/vendor. This private contract temporally takes the property off the market until all conditions for the private purchase contract are negotiated by the lawyer(s). What happens to the reservation fee if the buyer or the seller doesn´t want to continue the sale depends on the conditions in this contract. The reservation fee (la suma de reservación) is an amount of money (usually between € 3.000 and € 6.000) that is paid with signing the reservation contract of the real estate agency. This contract temporarily takes a property off the market until the conditions of the private purchase contract are negotiated by the lawyer(s). A solicitor is another word for lawyer, counsel, barrister or advocate (el abogado). In the Spanish purchase process a solicitor is responsible for most of the work which in other European countries is done by the notary, such as conducting the official investigation, checking outstanding debts, checking the legal content of the agreement and registering the property after the sale. 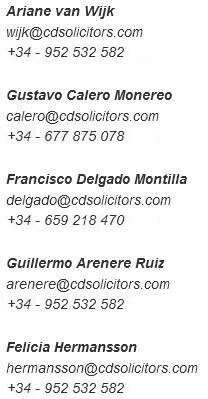 A Spanish solicitor needs to be member of a regional Bar Association for lawyers and is obliged to have professional liability insurance. A thirds account (la cuenta tercera) is a neutral bank account of a real estate agent or lawyer/solicitor into which a reservation fee or down payment can be paid. According to the specifications of the agreement the buyer gets his money back in the case that the sale is cancelled by the seller/vendor. The title deeds (la escritura) are an official public document which is signed at the notary during the completion. These title deeds prove without any doubt who is the legal owner of the property and therefore it´s always wise to sign this document and not just a private purchase contract. The original document stays at the notary´s office and the buyer will be provided with a copy with which the new ownership can be listed at the Registro de la Propiedad (land registry). Transfer tax (el Impuesto de Transmisiones Patrimoniales) is the tax the buyer needs to pay when purchasing a property. In Andalucia the transfer tax is 8% over the official value in the title deeds.